Fnatic saw OG eliminated from the Shanghai Major in the second major upset of the day during the third round of the main event’s Lower Brackets. OG, the Frankfurt Major Champions, was the tenth squad to be knocked out of contention. Fnatic will continue in the Lower Brackets. Tomorrow, two more teams will be eliminated. The Shanghai Major elimination series will continue on March 5th with Evil Geniuses vs compLexity Gaming at 03:00 CET followed by MVP.Phoneix vs. Fnatic. The upper bracket finals between Team Liquid and Team Secret will follow. Fnatic continued to come into the lower bracket elimination series looking to be in top form and renewed. With much improved drafting and solid coordination they were able to upset the Frankfurt Major Champions in a convincing 2:1 run. Chai “Mushi” Yee Fung and Zheng “Miduan” Yeik Nai both really stepped up to meet the challenge of survival head on. OG displayed remarkable patience and poise under pressure to force the third game. The Malaysian based squad got OG eliminated in a surprising turn of events with an clean and unstoppable last game. Two SEA teams and two North American teams will be competing as the last six teams standing, in an incredibly topsy-turvy turn of events. Four of the participating teams have advanced by coming through qualifiers – another incredible storyline for this second Major. The third day of the Shanghai Major began with the Upper Brackets series between Team Liquid vs MVP.Phoenix, followed by Evil Genisues vs Team Secret. Team Liquid and Team Secret have advanced in the Upper Brackets, while MVP.Phoenix and Evil Geniuses have dropped to the Lower Brackets. Alliance eliminated was the ninth squad to leave their Shanghai hopes behind. OG was the tenth team to be eliminated. The last series of the day started with a very even match up and back and forth swings in advantage. Fnatic were able to find a way to kite Sven and keep him from becoming too farmed, making him much more useless than he should have been. Fnatic’s picks were fantastic and the vision from the BeastMaster helped lot. Zheng “Miduan” Yeik Nai had a great Invoker game helping to move the team into the lead. In a sweeping 5 man wipe, Fnatic was able to claim the first game. @durkadota No, seriously dude. I want to know who is behind these drafts because it is total night and day, even just the bans alone. The second game, Fnatic made really smart decisions with their laning phases and picks. The roaming Bounty Hunter made it so that the heroes weren’t comfortable with their farming while the Lich seems to be a great counter for Enigma and OD. Fnatic were able to coordinate team fights and rotations beautifully. Chai “Mushi” Yee Fung was outstanding as Sven. With their backs against the wall, OG thrived under pressure and built their way back into contention. With an intense and exciting ending, OG held off and managed to seal the deal for the victory. After 67 minutes the teams will be starting their third and deciding match for elimination. Fnatic started out the third game with most of the map control and took the game lead immediately. They were able to just completely dominate and snowball through the European squad. They executed their strategy flawlessly. Another incredible game by Mushi on Spectre and Miduan with a perfect game on OD. Shanghai Major results: OG 1:2 Fnatic. 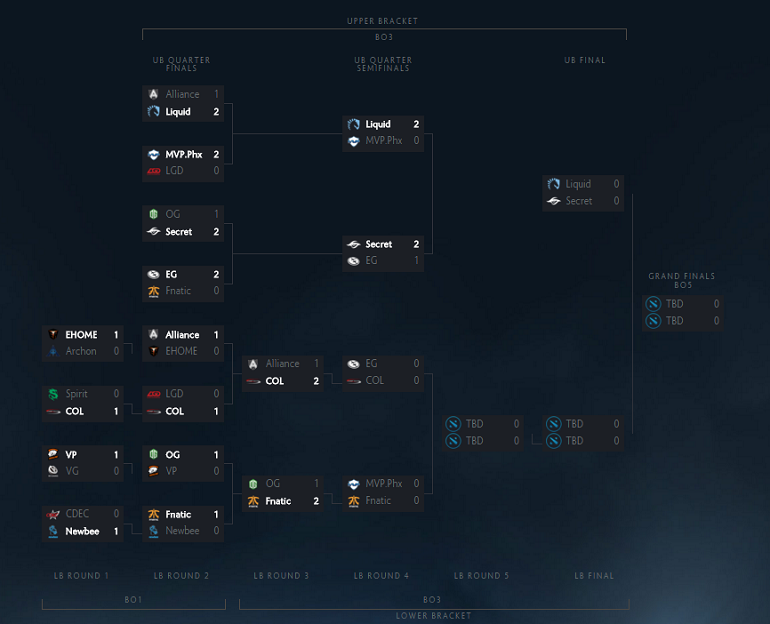 Fnatic continues in the Lower Brackets, after getting OG eliminated from the event. The Shanghai Major main event will take place between March 2nd-6th, at the Mercedes-Benz Arena, in Shanghai, China. Viewers and visitors are in for dawn to dusk action. The Grand Finals will take place on Sunday, March 6th. Sixteen teams will play a double-elimination bracket. Eight teams (top two teams of each of the four groups) will start the main event in the Upper Bracket. Eight teams (bottom two teams of each of the four groups) will start the main event in the Lower Bracket. 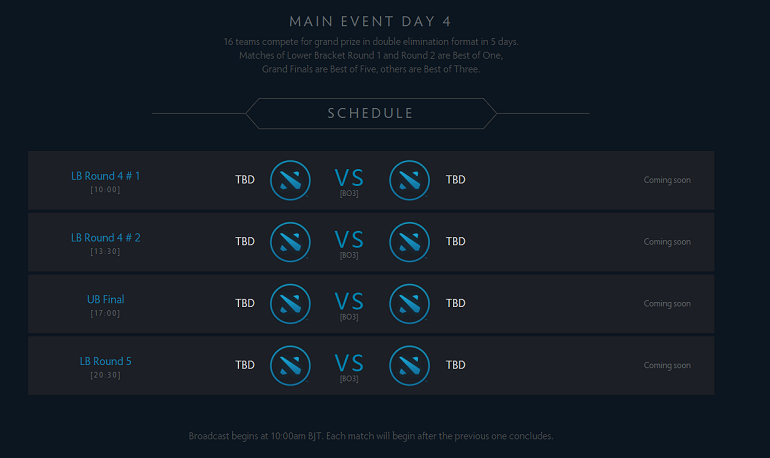 All the Upper Bracket match-ups will be best-of-three series. The first two rounds of the Lower Bracket matches will be best-of-one elimination series. The following rounds will be best-of-three elimination series. The Shanghai Dota Major Grand Finals will be best-of-five series, with no winners’ advantage.